The ledged and braced gate. Curved or straight top. These can be hung as a pair or usually as a single pedestrian gate (pictured). They are priced per leaf, therefore if you require a pair please choose a quantity of two. We can make these gates to the exact size you require, this is generally up to 1.8m, per leaf, in either direction. If you wish for your gates to be a certain size or want to confirm your made to measure price please call your local branch. 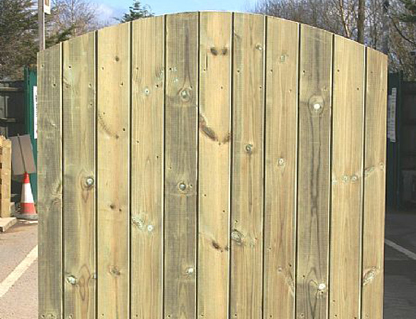 Our gates are made from a 27mm pressure treated, joinery grade, planed redwood and clad in a 14mm TGV board. Please specify the top you would like at checkout.